Dinamo Zagreb fans will not be permitted to attend the club's next European home game. 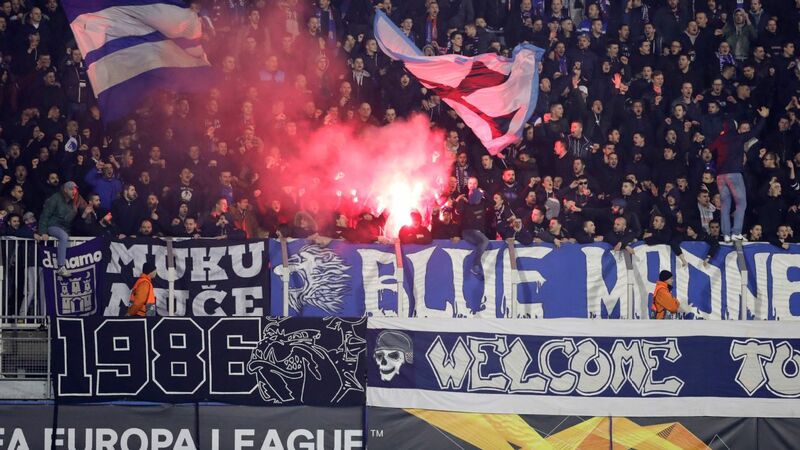 Dinamo Zagreb have been ordered to play their next home European match behind closed doors following racist behaviour by their fans in the Europa League game against Benfica, UEFA said on Monday. The Croatian champions were also fined €20,000 ($22,000) while an on order to play a second game behind closed doors was deferred for a probationary period of two years. The club were fined a further €47,000 for the setting off of fireworks and throwing of objects by fans and for blocked stairways. Liverpool defender Dejan Lovren was charged with giving false testimony in a trial against one of his former clubs. A Croatian court has dropped charges of perjury against Liverpool defender Dejan Lovren. But the Zagreb municipal court "rejected the indictment ... against Lovren," on Jan. 25, according to a tribunal statement, as cited by AFP. However, it added that the ruling can be appealed. ESPN FC's Alejandro Moreno explains why Gareth Bale has not been the player that Real Madrid needs him to be this season. Dani Carvajal forced an own goal and was instrumental in the second to help Real Madrid see through a 2-0 win over Valencia. Real Madrid's Luka Modric, FIFA's footballer of the year, will not face charges of giving false testimony in the criminal trial of his former boss at Dinamo Zagreb, who was convicted in June of evading tax and siphoning transfer fees from the club. A Croatian appeals court rejected a request by prosecutors to have charges reinstated against the Croatian international midfielder that had been thrown out by a lower court. Four-time European champions Ajax qualified for the Champions League group stage on Tuesday for the first time in four years, while AEK Athens and Young Boys Bern ended even longer absences. Ajax went to Dynamo Kiev with a 3-1 lead and that was the final aggregate result after the Dutch side were held to a 0-0 draw despite dominating.